Kingdoms rise and kingdoms fall, but the land? The land remains. This is true and very visible in the Tabanan regency of Bali. Tabanan has historically been plagued by wars, assassinations, and outcaste marriages between royal families. A turning point came during the Dutch invasion when the crown king and prince committed suicide while in captivity, and the surviving royal family members of this region were exiled to Lombok. Although the Dutch tried to restore Bali’s Kingdoms in 1929, by 1950 Indonesia’s royalty was abolished with the stroke of a pen by Sukarno. The absence of royalty turned the Penebel and Jatiluwih area into farmland. 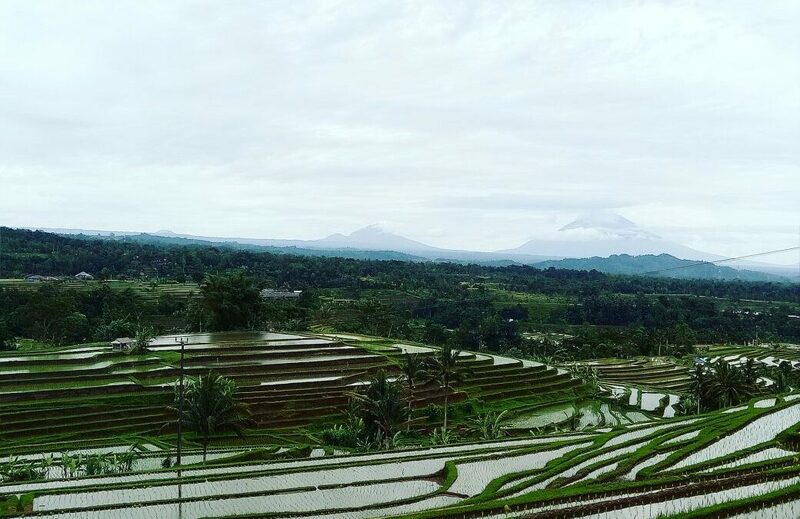 Today this area is home to thousands of rice paddies, including the famous Jatiluwih Rice Terraces. Hiking from Penebel to Jatiluwih is incredibly peaceful and beautiful. Along our journey we’ll take you over bridges and through the forest past the Besi Kalung (Iron Necklace) Temple where offerings are made to Dewi Sri the goddess of rice. Along the way you will pass vast swathes of rice paddies replete with petakut (scarecrows) that the farmers make to protect their crops. As the wind blows, hanging tins filled with stones make tinkling sounds to further ward off the birds. Our hike will end at the UNESCO World Heritage Site of the Jatiluwih Rice Terraces. Here thousands of rice paddies spill down the side of the hills in a ripple-like pattern. In the background you can see Mount Agung and Mount Batukaru, and in the other direction you can just make out the sea in the distance. This tranquil trek allows you to take in some of the best the best rice paddy views in all of Bali and experience the laid-back ambiance of this beautiful Balinese farming region where every farmer is king of his own crop.